I must say that given our unusually wet and cold spring, our garden has outdone itself so far this summer! We can hardly keep up with the harvest of tomatoes, zucchini, broccoli, lettuce, peppers and garlic. 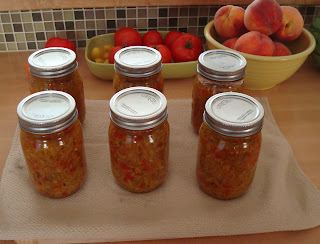 Not long ago Ferne over at Sew Sweet Thymes, quilter and gardener extraordinaire, sent me a recipe for Zucchini Relish. I'd recently purchased a pressure canner and would really like to get good at it! The last time I canned anything was in high school with my mother at my side - and you don't want to know how long ago that was! So here is my first solo attempt at preserving - Sweet Zucchini Relish. As of this posting, the lids have all sealed and they're ready to go! If you would like the recipe, just send me an email and I'll be happy to pass it on! I've also decided that I need to take a bit of a blogging break. Mr. Squash and I are headed to Canada on the 23rd for our annual "Big Fishing Adventure". This year we're going someplace new - Caverhill Lodge. With so much to take care of in the garden and yard as well as getting ready for the trip, I think I'd best spend a little time away from the computer. I'll be back sometime during the first week of September. I promise to take lots of pictures and to have lots to blog about soon! Another yummy recipe!! Have fun!! I hope to see lots of pics!! Enjoy your vacation! We will miss you. I've never heard of zucchini relish. What's it taste like? Have a great trip. We'll be here when you get back. We'll be waiting for you when you get back. Enjoy your break and your trip! Have fun fishing, have a great trip! Have a good time fishing. Hope you have someone to take care of your garden while you are gone. Nice to see the fruits of your labor! Zucchini relish is actually better than pickle relish in my opinion. Enjoy your time off with Mr. Squash! Congrats on your new title, canner! Have a wonderful vacation. Cool! Caverhill Lake is up in my part of the country. We live on the "other" side of Kamloops, but I've been up that way a couple of times over the past few years. Beautiful country - except for the parts that burned in the big 2003 wildfires. If you get the chance, plan a day trip to Wells Gray Provincial Park just a little north of Clearwater. Enjoy your trip! Have fun canning your harvest and enjoy the fishing holiday! May you both have a wonderful and safe trip. Hope you catch lots of rainbows! Have a great trip to Beautiful British Columbia! Your vacation plans look like great fun! I would love to try your relish recipe! I am in the middle of canning experiments this week and am always looking for good recipes. Have a wonderful holiday and fun gathering in your harvest. Wishing you a wonderful vacation. Best of luck wetting the hooks. Don't work too hard before you go. Blessings! Enjoy your vacation and your blog break.